All through my adult life, I have been an 8-to-5 worker. Now I have stepped out from that comfort zone and joined the ranks of entrepreneurs. With this shift in my life, I began to notice how people around me make income. I started to observe and compare those who had 8-to-5 jobs with those who run small home-based businesses. This blog post here is about creativity and entrepreneurs. I show you 20 creative home based business ideas from Indonesia. That is how millions make a living and support their families. For the last seven years, I have lived in Indonesia. It’s a wealthy country but sadly, the big majority of it’s 240 million population is poor or very poor. There are not enough jobs available, and people are forced to be creative. “You don’t work, you don’t eat,” they tell you. If you want to be an entrepreneur, you have to be creative also. So you can learn from them. 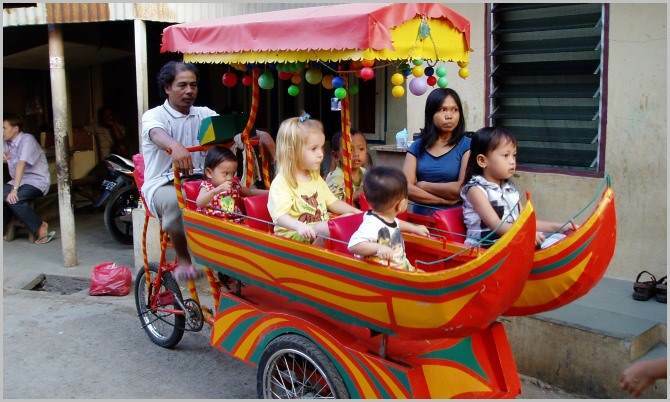 This man is riding his mobile carousel around Jakarta slums, and poorer neighbourhoods are enabling poorer kids to get a ride. An about 10-minute ride costs 08 cents. In case he rents the carousel, he has to pay daily rent too. 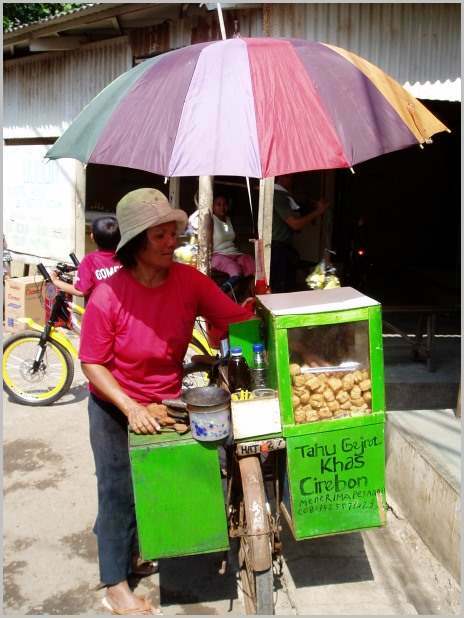 Food stalls like the one in the picture above are hugely popular in Indonesia. 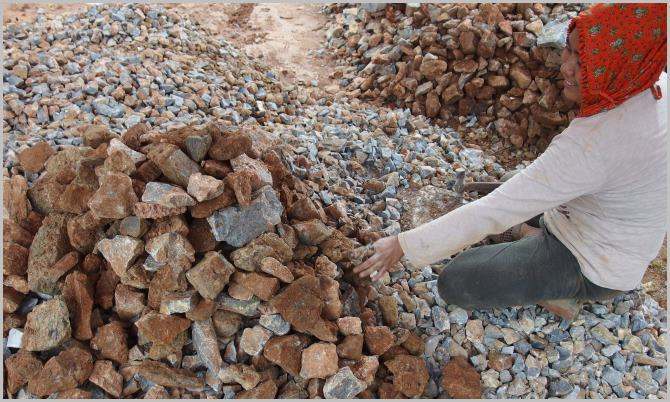 They give people an opportunity to make a living. Don’t you have a job? Then learn to cook (to know how to cook just one type of food is enough). Buy stuff from the local market and prepare the food. 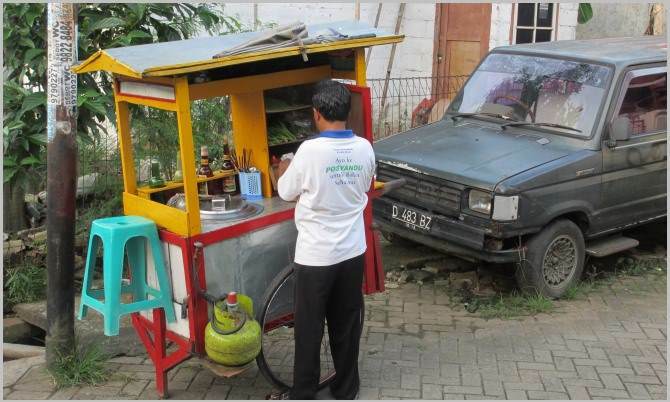 Then walk your food stall through local neighbourhoods, find some hungry customers and serve them. 3. The Collector of Plastic Bottles. 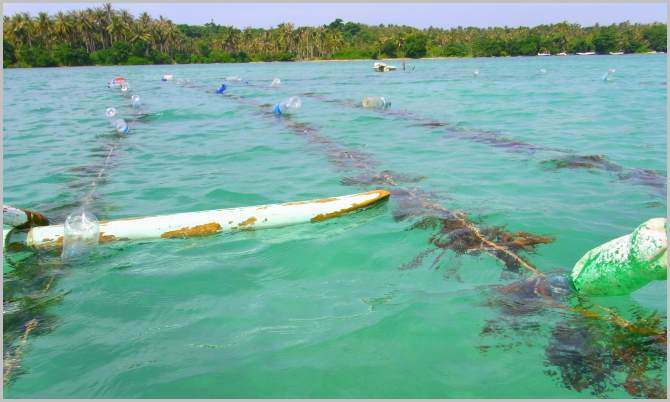 Many earn their income by collecting and selling used plastic bottles. Used plastic is cheap and selling it does not make you rich, but at least, it brings bread to peoples’ table. Indonesia is a country with hot and humid climate. It’s hard to live here without air conditioners. This fact turns AC Service a lucrative niche for many. 5. Shoe repairers at the local market. 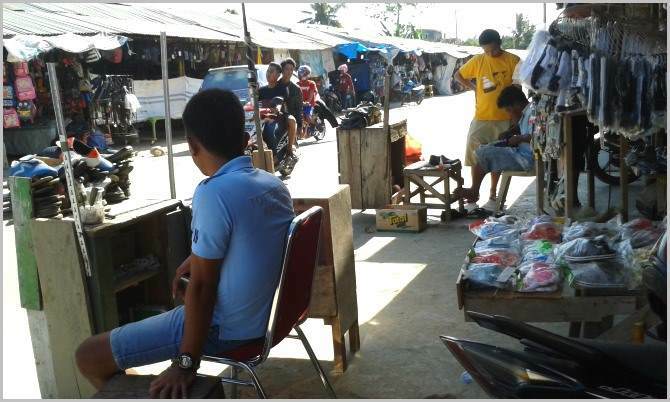 This young shoe repairer opened his workshop right in the center of the local market in Kendari, SE-Sulawesi. 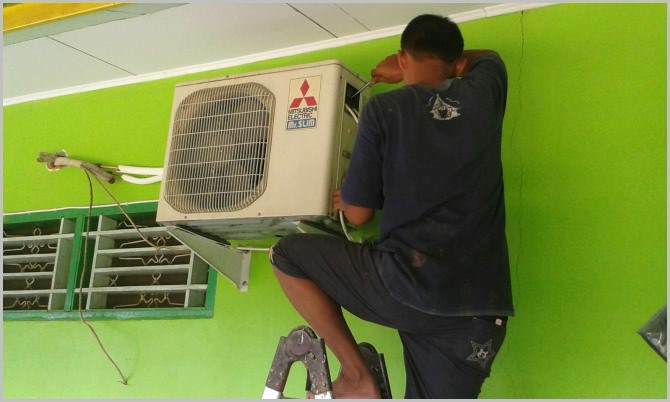 It’s always hot, dusty and noisy here, but this is what he can do to support himself and his family. 6. Plastic Household Ware Salesman in Action. 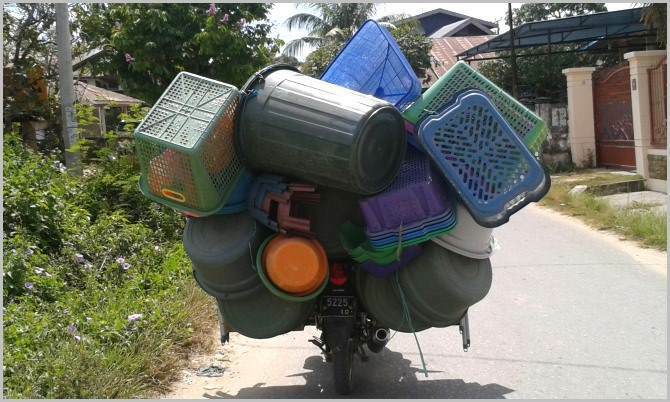 This motorbike is like a mobile shop, right? 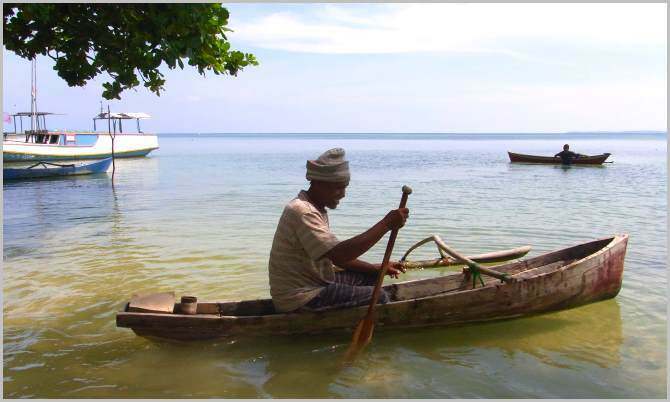 This entrepreneur does not have a car to run his business, but it does not stop him. 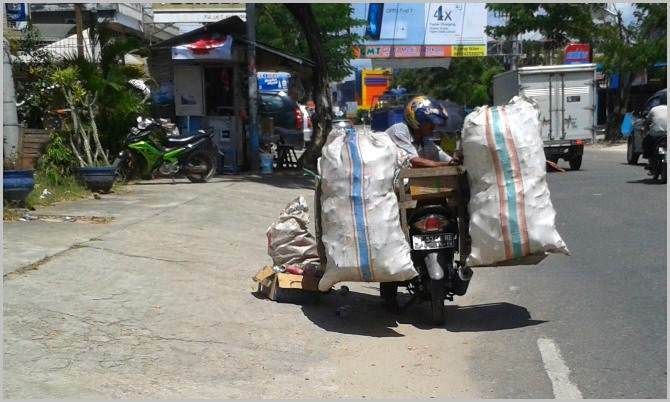 If you cannot afford a car, do it by motorbike. 7. 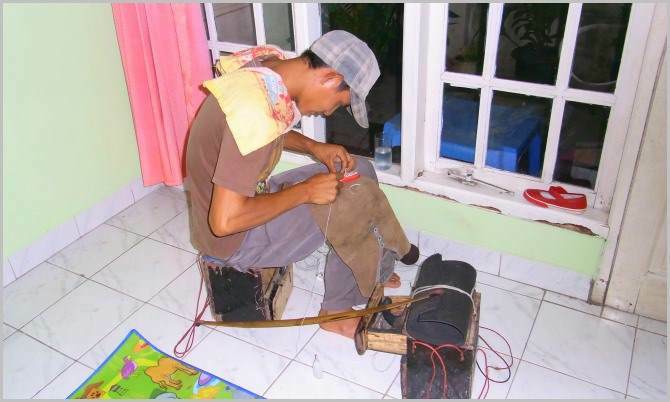 A Shoe Repairer in Action. This young shoe repairer has a different strategy. To find his customers, he walks through the neighbourhoods and shout. Cheap shoes mean bad quality and thus there are always those who need his services. This type of entrepreneurship is (at least in my opinion) is one of the laziest ways to make money. It’s just one step above begging. They offer you some service (music, singing and some entertainment in this case) and expect you to pay for that. That is a family business. 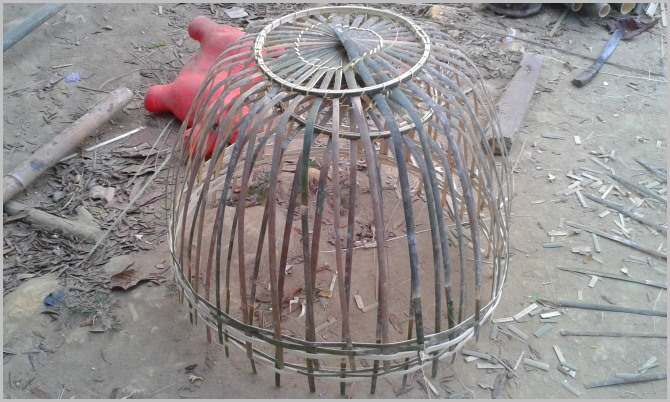 They buy raw bamboo stems, then make everything from bamboo that they can sell. 10. A Street Vendor Selling Tofu Products in a Jakarta Slum. If you don’t have a job, cooking skills often open you a door into the entrepreneurship world. This lady here has focused on making tofu products and selling them in Jakarta poorer neighbourhoods. 11. A Cracker Salesman Delivering His Products. 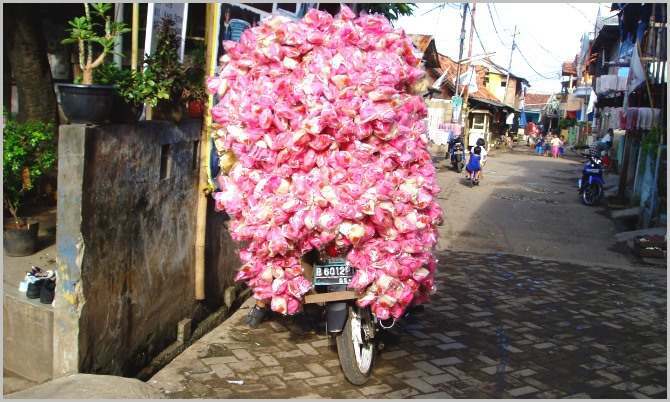 Crackers are hugely popular in Indonesia. There are thousands (if not millions) of family businesses in Indonesia who makes a full time living by cooking, packing and selling crackers. 12. Clean Water Delivery Man. This man is a rice farmer from a rural area in Java. He spends his off-seasons in Jakarta to make some extra cash and thus support his family. 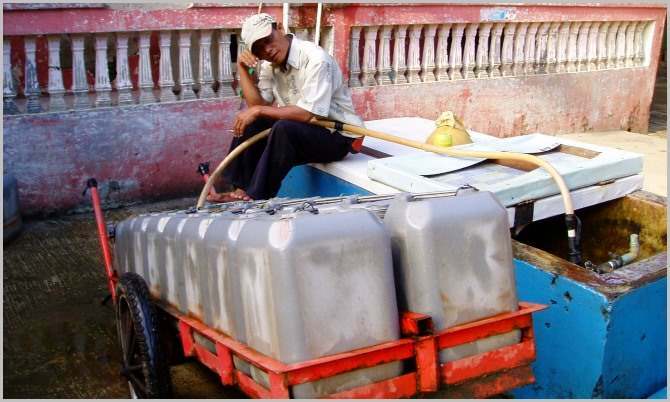 He rents a trolley and provides clean water delivery to nearby households. In my opinion, another lazy way to make money. But at least, it is an option if you don’t have anything else but a motorbike. Or if you don’t have it, you can always rent it. 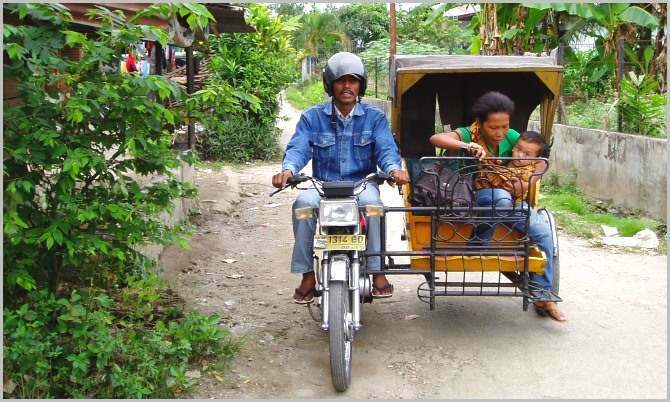 Sadly, way too many young Indonesian men choose to become pedicab taxi riders. It’s because neither education nor hard work is required. A lot of sitting and a little bit riding, that’s it. 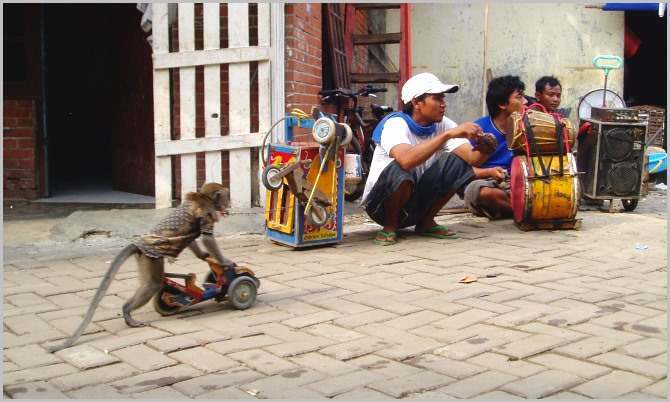 Young Indonesian men often choose to run a monkey show to feed themselves and their families. 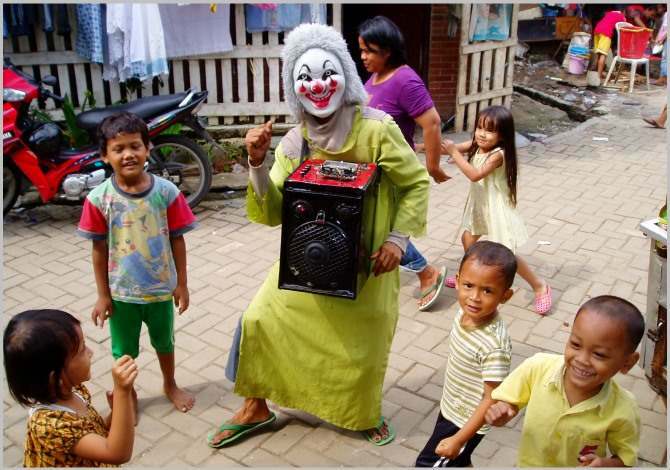 Once the animal is well trained, they walk from the neighborhood to neighbourhood giving 10 minutes long shows and collecting money from the spectators (mostly kids). 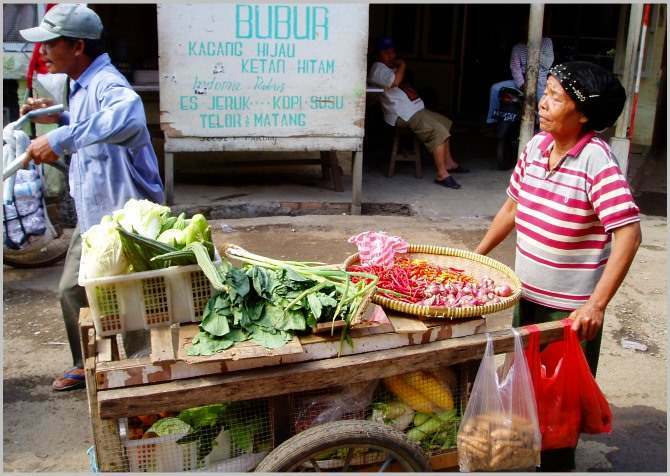 This old lady is yet another street vendor selling veggies in Jakarta poor neighbourhoods. What is impressive with these street vendors is that many of them have done it for decades. Often 20 to 40 years. 16. Making Cheap Paper Dolls for Sell. To make some desperately needed cash this mother of 2 began to make small, cheap paper dolls and sell them in front of local public schools. That is another example how poor people use their creativity to support their families. 17. Grilling and Selling Corn Cobs. 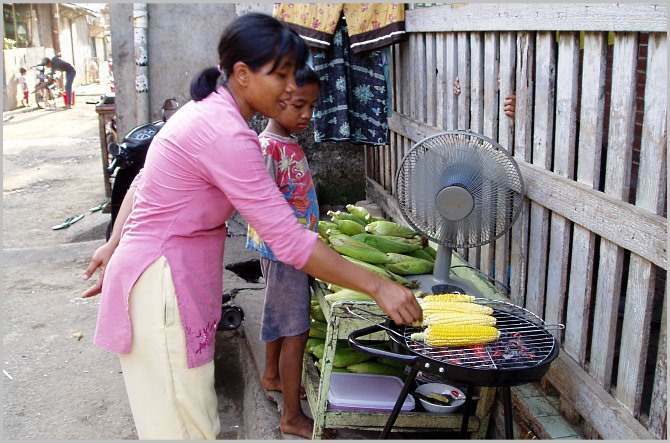 To support her family, this mother of 3 opened a food stall in front of her home and began to grill and sell corn cobs. In fact, she didn’t have any proper grill to run the business, so my family and I bought her one. 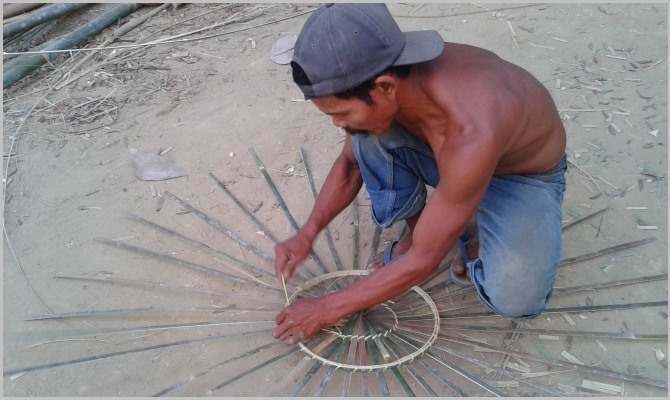 That is a surprising way to make money, but it happens in many villages in SE-Sulawesi. 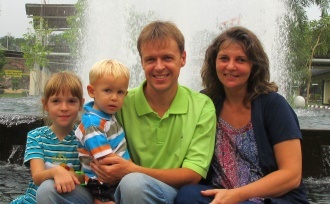 Whole families – men, women and children make aggregate. All you need to do is to hit rocks with a hammer, and that’s it. It’s boring and time wasting job, but, at least, it gives the work for hundreds (if not thousands) of families. 19. 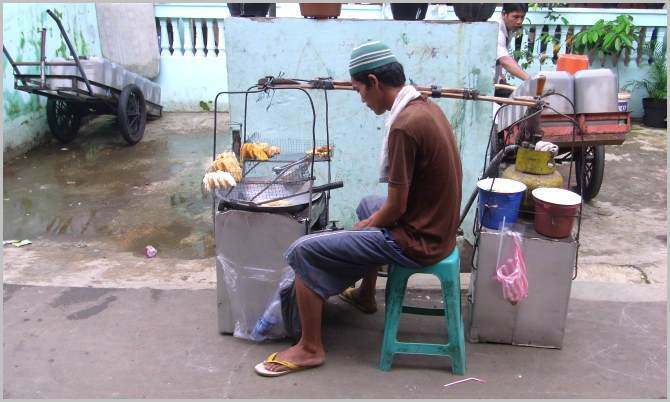 A Young Street Vendor Selling Fried Stuff. This young man does not have neither a trolley nor a bike to sell his stuff. But at least, he does not sit idle, complaining: Give me a job. Give me a job. He uses his creativity, cooks and walks through the neighbourhoods, selling his stuff (fried bananas, fried sweet potatoes, etc. ).